You are here: Home / News / Checks Are in the Mail for May Day! As of today, International Workers’ Day, checks for approximately $9.5 million are in the mail to almost 2,500 freelance writers whose works were copied and distributed in electronic form by publishers of print periodicals who had neither paid for nor acquired digital rights to these articles. These payments today of millions of dollars to thousands of writers by a rogue’s gallery of copyright-infringing and writer-exploiting publishers, including the New York Times, the Washington Post, and numerous other “reputable” and “legitimate” newspapers and magazines, were made possible by the Supreme Court decision in New York Times v. Tasini, a landmark lawsuit brought by the NWU with our then-president Jonathan Tasini, a freelance contributor to the Times and other publications, as the lead plaintiff. The Supreme Court settled the legal question unambiguously in 2001 in favor of the small group of freelance writers in whose name the NWU brought the “test case.” But as writers know, being legally entitled to payment doesn’t automatically lead to getting paid. Publishers could have recognized the precedent set by the Supreme Court, and offered payments to writers for the damage they had already done. But rather than admit that they had been ripping off writers and violating their rights by distributing their work in digital form without payment or permission, publishers dragged writers through 17 more years of litigation before finally sending out payments to writers this week. Three class-action lawsuits, including one initiated by the NWU, were filed against periodical publishers and the distributors of digital versions of articles licensed by freelancers for print (but not digital) publication. Those three lawsuits were eventually consolidated for settlement purposes. But the defendants continued their unconscionable foot-dragging even after agreeing to pay the writers. 42,000 claims for compensation by writers were disputed by publishers for such patently bad-faith reasons as the writer having abbreviated “The Washington Post” to “Wash Post” on the claim form, or making a claim for an article published in “Modern Maturity” rather than “AARP Modern Maturity.” Objections and obstructionism by publishers delayed payments for several more years. In the meantime, it’s become clear that rights to digital distribution of works first published in print form are more valuable than ever. The Times and other periodicals have been aggressively monetizing their digital archives, selling access to individual articles and using access to the archives as a valuable benefit to drive subscriptions. And freelance writers have been earning a growing share of our income from new digital editions and formats — Web content, new e-book editions, paid downloads of individual articles, licenses for use in apps and electronic games, etc. — of works previously published in print. The issue, of course, is whether writers will receive the revenues from these new uses of our work, or whether the publishers of previous print editions of our work will steal our digital rights or claw them back by intimidating writers into contract amendments or givebacks. The NWU remains committed to this battle for backlist and digital rights, both through our advice to writers negotiating new contracts and our advocacy for those whose previous contracts have been, and continue to be, violated by publishers. No individual writer could have successfully pursued these lawsuits. The lesson of the settlement payments in the mail today to freelance writers couldn’t be more appropriate for this International Workers’ Day: Writers are getting paid because, and only because, we banded together to defend our rights. 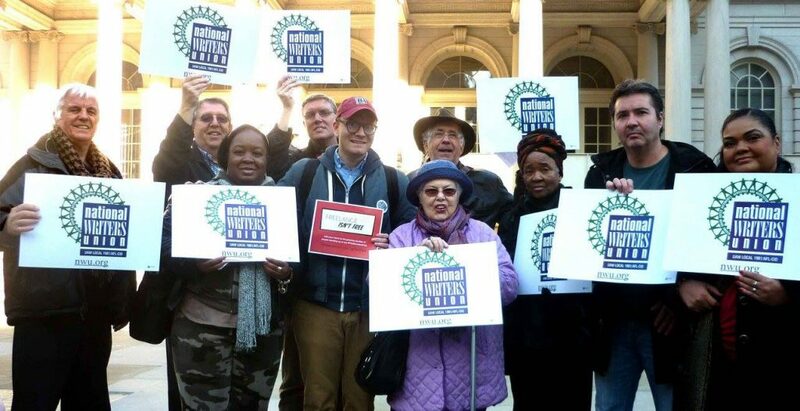 The NWU congratulates the working writers who earned these payments and deserved them years ago. We invite all writers who want fair pay to join us. If you get an envelope like this in the mail, it’s not junk mail! To check on the status of your claim, email the claims administrator at CopyrightSettlement@girardgibbs.com . If you don’t have your claim number you will need to contact the claims administrator at CopyrightSettlement@girardgibbs.com.